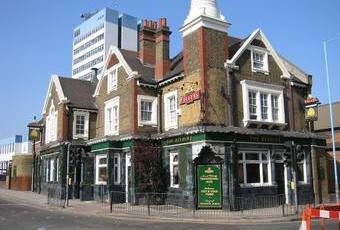 Fuller's pub on Brentford High Street that I have passed by on a number of occasions. I've often admired the tilework. But knowing it's a Fuller's pub, I've never ventured in. I decided to put that right on Sunday evening. We immediately quadrupled the customer base. But we had a good conversation with the guy sat at the bar and the barmaid about the local area. Pride & ESB were the real ales. Needs a few customers. But not a bad pub. Smells of piss and weed. Patrons are terribly awful. Punters are worse. This pub is so fantastic I actually had a religious experience in there!